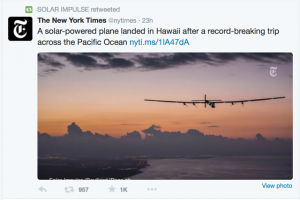 Teach your students about the Solar Impulse 2! FREE Downloadable Materials! 名古屋市昭和区の英会話スクールBigBowEnglishLab > ブログ > Teach your students about the Solar Impulse 2! FREE Downloadable Materials! Congratulations to the Solar Impulse 2! It safely touched down in Hawaii without using a drop of gasoline, flying across the Pacific Ocean on solar power only. As I wrote in my last blog post, I was lucky to be able to see this airplane when it made an unexpected month long stop at Komaki airport in Nagoya. I was so inspired that I decided to create some materials to teach my students about this amazing project. I also decided to share these materials with other busy teachers around the world. There are four files: worksheet 1 is for young children, worksheet 2 is for older students with basic reading skills, worksheet 3 is a WebQuest, and the last page is for teachers - an Answer Key and map activity suggestions. Please use these materials and share them freely! Special thanks to John Ahern, Mark Mino-Thompson, Christopher Madden, and Mari Nakamura for proofreading and offering feedback!